This was my middle school book series. I read it over and over and over (and, as you may have guessed, over and over…). Even rereading it as an adult, I just…cannot separate all those happy memories So keep in mind, my review might be is more than a bit biased. Eragon, a farmboy, stumbles upon a suspicious blue stone while hunting in the Spine (an area that few would go to even in the best of times). He loses sight of his prey but brings home the stone anyway figuring that he might sell it. However, once folks find out it’s from the Spine – they refuse to touch it. Begrudgingly, Eragon takes it home only to discover, a few short days later, that the stone is not a stone…it is an egg. And while Saphira (his young dragon) is cute for the first few weeks…Soon, Eragon realizes that keeping a dragon, even a young one,is no easy task. 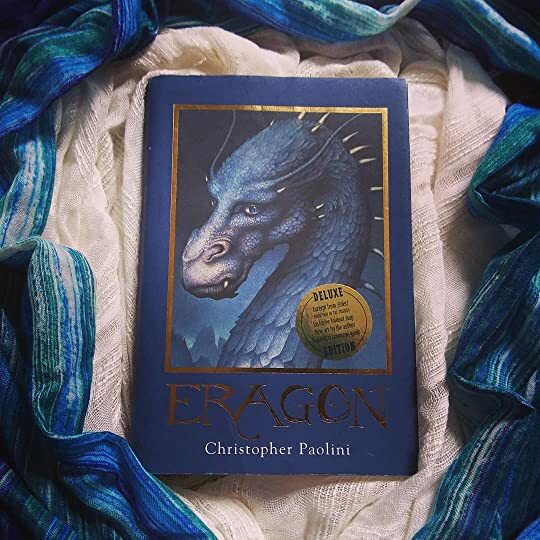 When a tragedy befalls Eragon’s family, he sets off with Brom, a local storyteller, and Saphira on a quest for revenge. While the book may be the best of the best…this audiobook (narrated by Gerard Doyle) was not. In particular, Saphira’s voice was absolutely, hands-down, the worst voice ever bestowed upon a dragon. I could understand going for a deeper voice for a dragon, but she’s a young, female dragon, not a crotchety 1000-year-old yoda-esque dragon with a chip on his shoulder. It was painful to listen to. Over 10 hours of a deep, guttural flem-in-the-back-of-your-throat sort of voice.